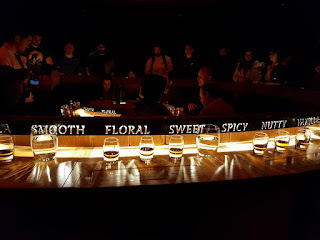 Dopo aver visitato la fabbrica del Jack Daniel's a Lynchburg, Tennessee (http://duecuoriperviaggiare.blogspot.com/2018/12/usa-deep-south-texas-louisiana-alabama_14.html), non potevamo resistere al fortissimo richiamo del whiskey creato nel 1780 dal signor John Jameson, che mise a punto una tecnica di produzione dell'Irish Whiskey alla quale ancora oggi la Jameson Distillery si attiene diligentemente ed orgogliosamente. Ovviamente, con la vendita annuale di più di 22 milioni di bottiglie, il Jameson Irish Whiskey è il whiskey irlandese più venduto al mondo. After visiting the Jack Daniel's factory in Lynchburg, Tennessee (http://duecuoriperviaggiare.blogspot.com/2018/12/usa-deep-south-texas-louisiana-alabama_14.html), we could not resist the very strong call of the whiskey created in 1780 by Mr. John Jameson, who developed a production technique of the Irish Whiskey which even today the Jameson Distillery diligently and proudly shall follow. Obviously, with the annual sale of more than 22 million bottles, the Jameson Irish Whiskey is the best selling Irish whiskey in the world. 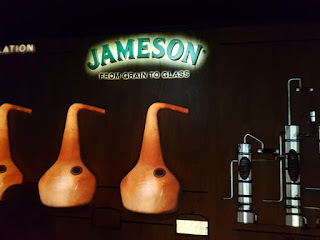 La prima cosa che dovete sapere è che sono due le distillerie Jameson in Irlanda. L'originale la trovate proprio a Dublino, nella celeberrima Bow Street, ma non è qui che viene prodotto il whiskey Jameson. La relativamente giovane distilleria di Midleton, nella Contea di Cork, produce ora, infatti, gran parte del whiskey venduto nel mondo. Il nuovo stabilimento integra quello di Bow Street, che ora, denominato Jameson Old Distillery, è prevalentemente un'attrazione turistica. 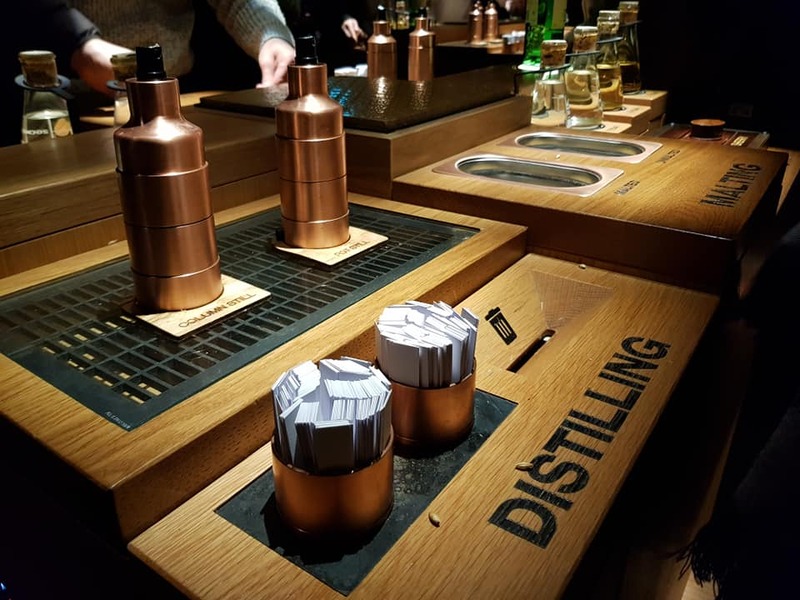 Ed è proprio qui che si riversano ogni giorno centinaia di turisti ed appassionati, pronti ad intraprendere un viaggio nella storia del whiskey irlandese, prima con il tour guidato e poi sorseggiando un cocktail nel sempre affollato bar della distilleria ed acquistando prodotti griffati Jameson al Bow Street Market. 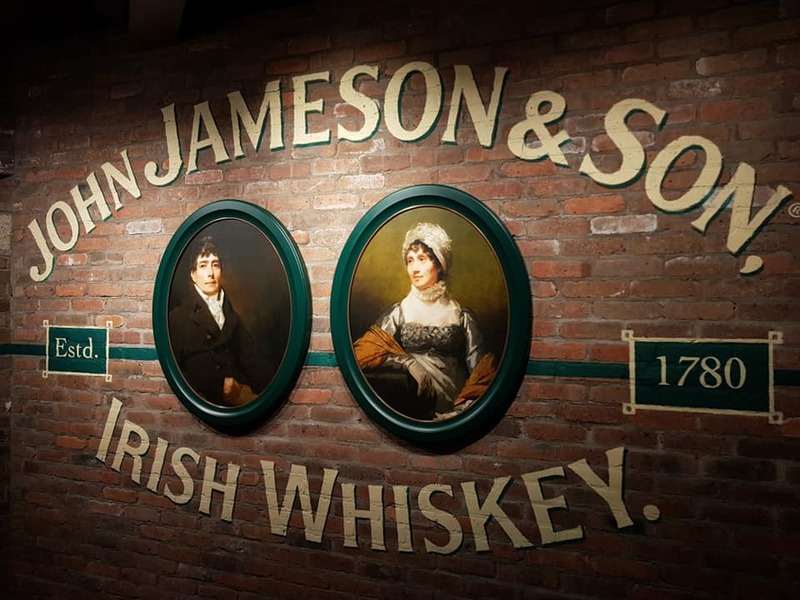 The first thing you need to know is that there are two Jameson distilleries in Ireland. The original one can be found in Dublin, in the famous Bow Street, but it is not here that Jameson whiskey is produced. In fact, the relatively young Midleton distillery in County Cork now produces much of the whiskey sold in the world. 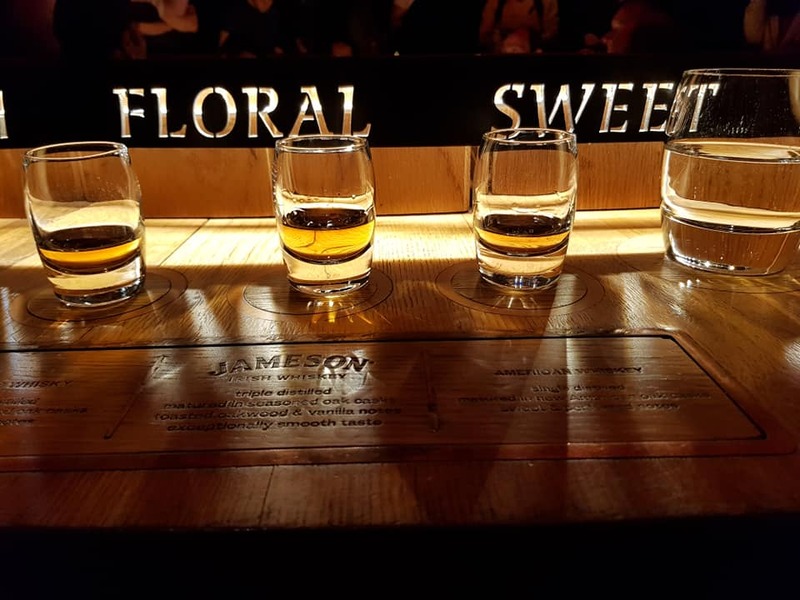 The new plant integrates that of Bow Street, which now is called Jameson Old Distillery and is a kind of a tourist attraction. And it is precisely here that hundreds of tourists and enthusiasts come every day, ready to embark on a journey into the history of Irish whiskey, first with the guided tour and then sipping a cocktail in the ever-crowded distillery bar and buying Jameson products at the Bow Street Market. 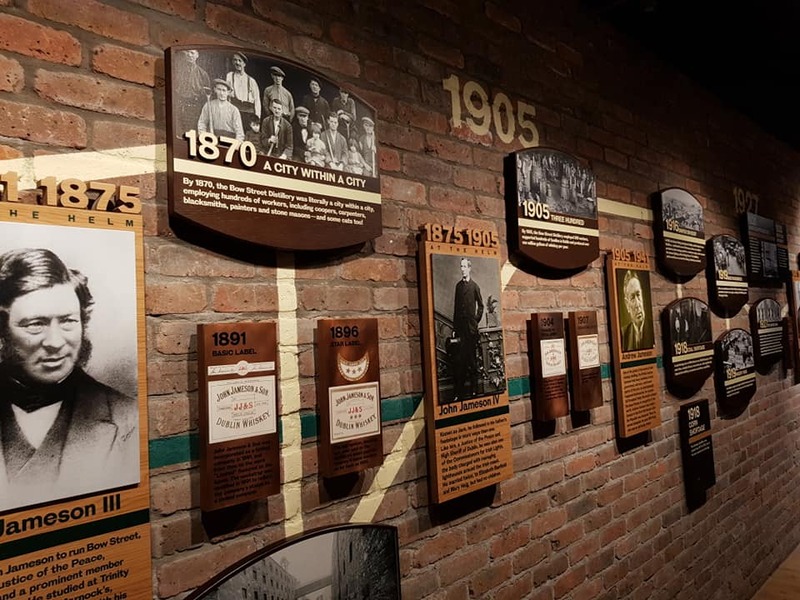 Ecco, la visita alla Jack Daniel's Distillery è sicuramente più avvincente per tanti motivi (il whiskey viene prodotto proprio lì e si visitano i luoghi sacri della produzione e dell'imbottigliamento), ma anche alla Jameson Old Distillery non vi annoierete di certo, a prescindere dal tour guidato che sceglierete. Il più semplice, ma anche il più famoso, è il Bow Street Experience, un tour di 40 minuti durante il quale imparerete a conoscere la storia del whiskey irlandese, dall'inizio alla fine. Il Jameson è prodotto da una mistura di orzo irlandese maltato e non maltato. L'orzo è fatto asciugare in un essiccatoio chiuso e riscaldato con carbone di pura antracite per preservare il suo chiaro sapore di malto. Come gran parte dei whiskey irlandesi subisce una tripla distillazione. 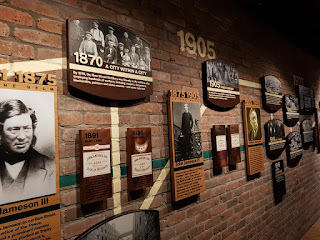 Well, the visit to the Jack Daniel's Distillery is certainly more exciting for many reasons (the whiskey is produced right there and you could visit the sacred places of production and bottling), but even at the Jameson Old Distillery you won't certainly get bored, no matter what kind of tour you choose. 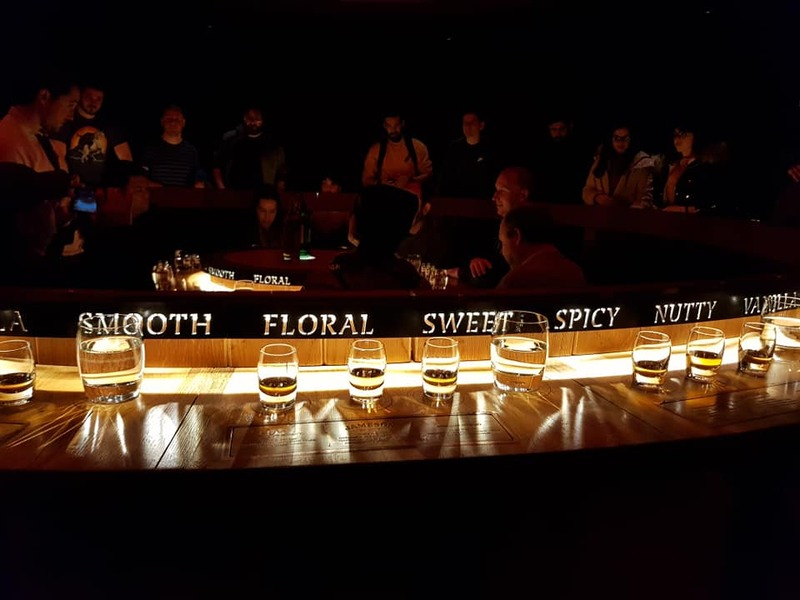 The simplest, but also the most famous tour, is the Bow Street Experience, a 40-minute tour during which you will learn about the history of Irish whiskey, from the beginning to these days. Jameson Irish Whiskey is made by blending rich pot still whiskey made from both malted and unmalted barley, with the finest grain whiskey, both distilled 3 times for smoothness. Forget lucky number seven, Jameson's smoothness comes from a triple distillation process. It’s the method our founder John Jameson built his name on and the legacy our Head Distiller Brian Nation upholds to this day. E non mancherà il taste finale di uno scotch, di un Jack Daniel's ed ovviamente un Jameson, per scoprirne le differenze principali. Al termine del tour non dimenticatevi di sorseggiare gratuitamente al bar il favoloso cocktail Jameson Ginger and Lime, compreso nel prezzo del biglietto. Il costo del tour è di 22 euro per gli adulti, 18 per studenti e over 65. And you won't certainly miss the final taste of a scotch, of a Jack Daniel's and obviously of a Jameson, in order to appreciate differences. At the end of the tour, don't forget to sip the fabulous Jameson Ginger and Lime cocktail at the bar: it's included in the ticket price. The cost of the tour is 22 euros for adults, 18 for students and over 65. Per chi volesse vivere un'esperienza ancora più emozionante, potrà provare il tour Whiskey Cocktail Making Class, un tour di 60 minuti (che non comprende la visita guidata) durante il quale prenderete parte ad una masterclass e imparerete a preparare ben 3 cocktails. A base di Jameson ovviamente. Il costo del tour è di 50 euro. 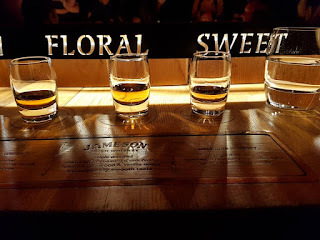 Il terzo ed ultimo tour disponibile è il Whiskey Blending Class, un tour di 90 minuti (che non comprende la visita guidata) tenuto da un Jameson Ambassador, nel quale potrete imparare l'arte del whiskey Jameson. 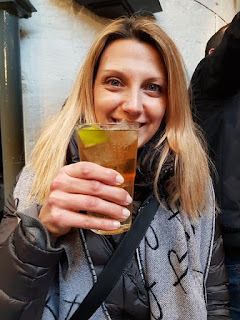 Un tour per veri intenditori che, durante la visita, potranno assaggiare anche i whiskey Jameson più rinomati. Il costo del tour è di 60 euro. 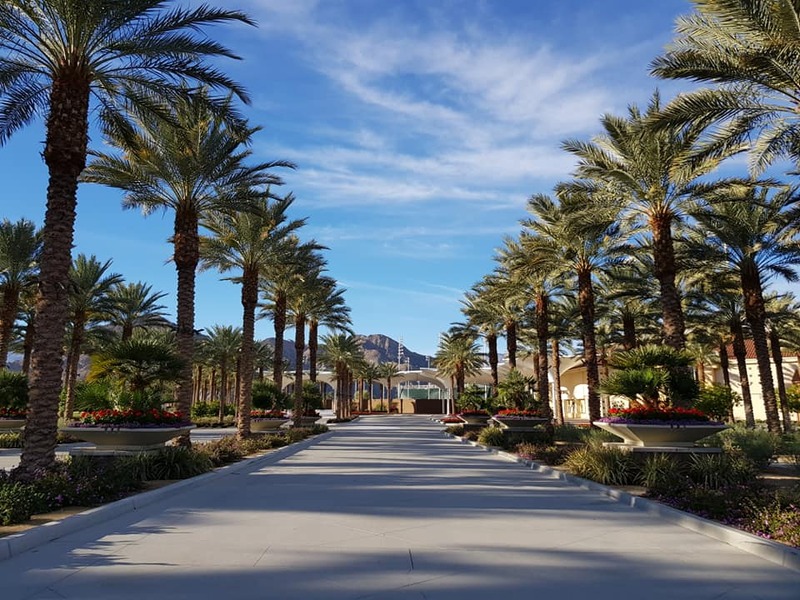 Cosa vedere a Palm Springs? Quanti giorni dedicare a Palm Springs? Val la pena fare tappa nella più famosa oasi del deserto degli Stati Uniti? 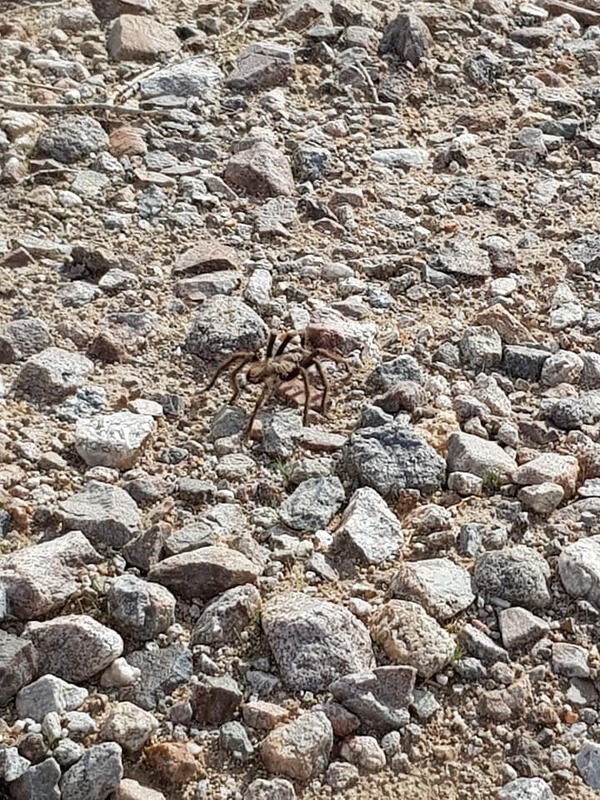 Nonostante sia piuttosto famosa in queste latitudini, Palm Springs continua ad essere un amletico dubbio per moltissimi viaggiatori che esplorano i grandi parchi del west e la Southern California. E, le tre domande con qui abbiamo aperto il post, rappresentano un classico nei forum e nei gruppi specializzati perchè, alla fine dei conti, sono in molti quelli che per forza di cose si trovano "costretti" a passare dalle parti di Palm Springs in direzione San Diego, Los Angeles o, dalla parte opposta, in direzione Las Vegas o Grand Canyon, ma sono in pochi quelli ad avere le idee chiare su quanti giorni dedicare all'intera area e soprattutto, come viverla al meglio. Anche perchè, dopo tutto, Palm Springs e tutte le cittadine che la circondano, sono note come paradiso per chi vuole svernare sotto il sole cocente del deserto del Sonora. Non esattamente la meta costruita dal sarto per chi, durante un on the road, voglia vivere esperienze indimenticabili. 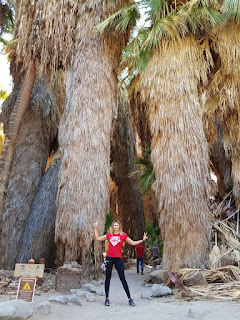 What to see in Palm Springs? How long should i stay in Palm Springs? Is it worth stopping in the most famous desert oasis in the United States? 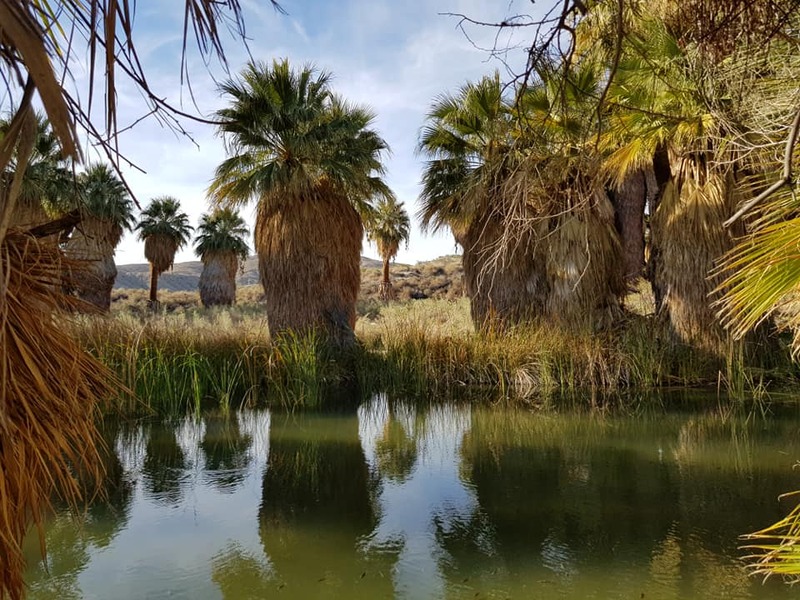 Despite being quite famous in these Europe, Palm Springs is still a a question mark for many travelers who explore the great parks of the west and Southern California. 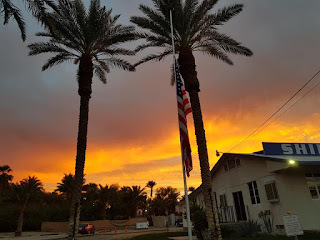 And, the three questions we mentioned at the very beginning of the post represent a classic in the forums and in the specialized facebook groups because, in the end, there are many people who inevitably find themselves "forced" to cross Palm Springs while getting to San Diego, Los Angeles or, on the opposite side, towards Las Vegas or Grand Canyon, but few people have clear ideas on how many days to spend visiting to the whole area. 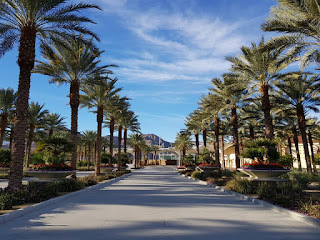 Also because, after all, Palm Springs and all the towns that surround it, are known as a paradise for those who want to spend the their time under the scorching sun of the Sonora desert. Not exactly the destination for those are on the road and want to experience the unforgettable magic of the west. 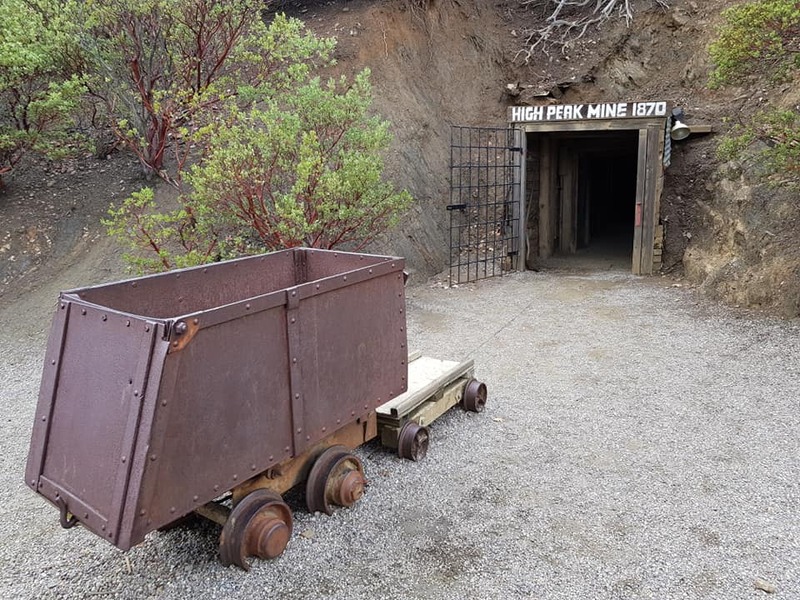 Il più sottovalutato degli State Park della California? Senza ombra di dubbio l'Anza Borrego Desert State Park. Nello scegliere i luoghi, a parere nostro imperdibili, nell'area di Palm Springs con a disposizione tre giorni, abbiamo dovuto rinunciare a malincuore a tanti gioiellini, più o meno nascosti, ma non potevamo escludere dalla lista quell'enorme deserto che prende il nome dall'esploratore spagnolo Juan Bautista de Anza, che attraversò l'area nel 1774, e dal termine spagnolo Borrego, che significa pecora, l'animale più diffuso del parco. Which is the most underrated of California State Parks? 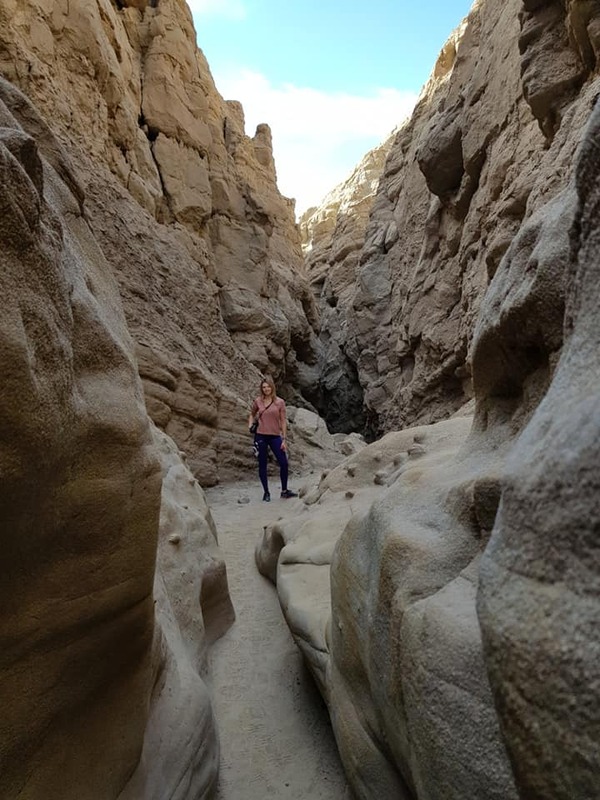 Without a doubt the Anza Borrego Desert State Park. In choosing the unmissable places to visit in the Palm Springs area with three days available, we had to reluctantly give up to many little gems, more or less hidden, but we could not exclude from the list the huge desert that takes its name from the Spanish explorer Juan Bautista de Anza, who crossed the area in 1774, and from the Spanish term Borrego, which means sheep, the most widespread animal in the park. 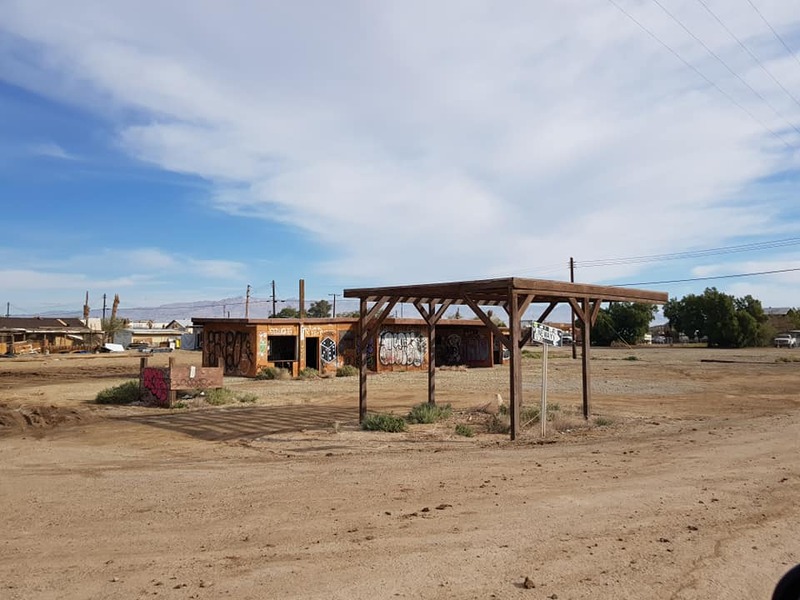 La città di riferimento è Borrego Springs. 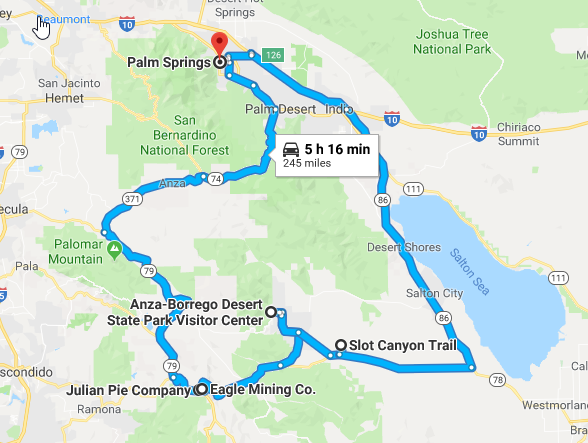 Al visitor center (300 Palm Canyon Dr, Borrego Springs), potrete scoprire i piccoli segreti sull'area e sui trail, e cominciare a prendere confidenza con il deserto percorrendo l'anello di 4.8 km che conduce al Borrego Palm Canyon, un paradiso d'acqua alimentato da sorgenti sotterranee. The reference city is Borrego Springs. 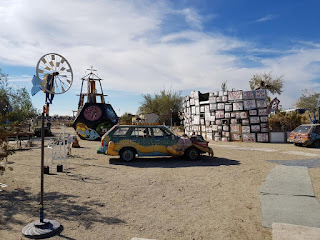 Stop at the visitor center (300 Palm Canyon Dr, Borrego Springs) where you could discover the little secrets of the area. 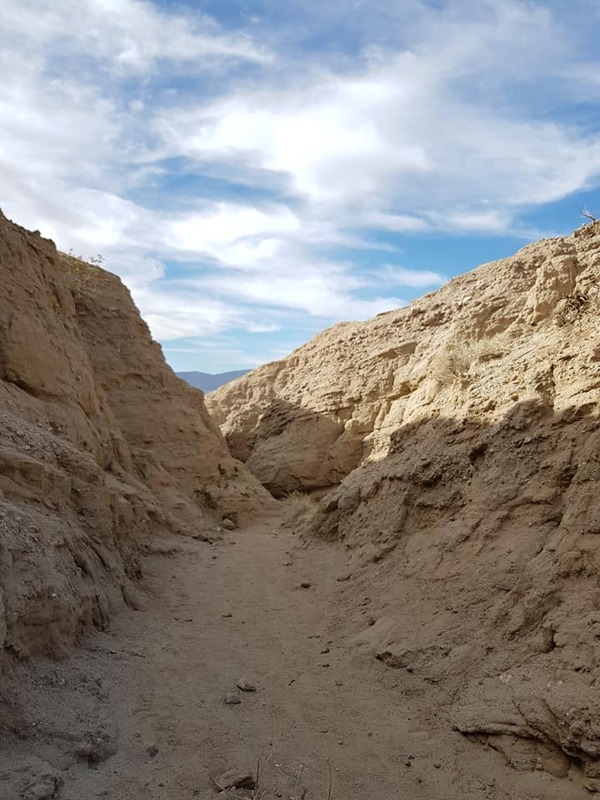 learn about the trails, and begin to familiarize yourself with the desert along the 4.8 km loop trail that leads to the Borrego Palm Canyon, a paradise of water fed by underground sources. 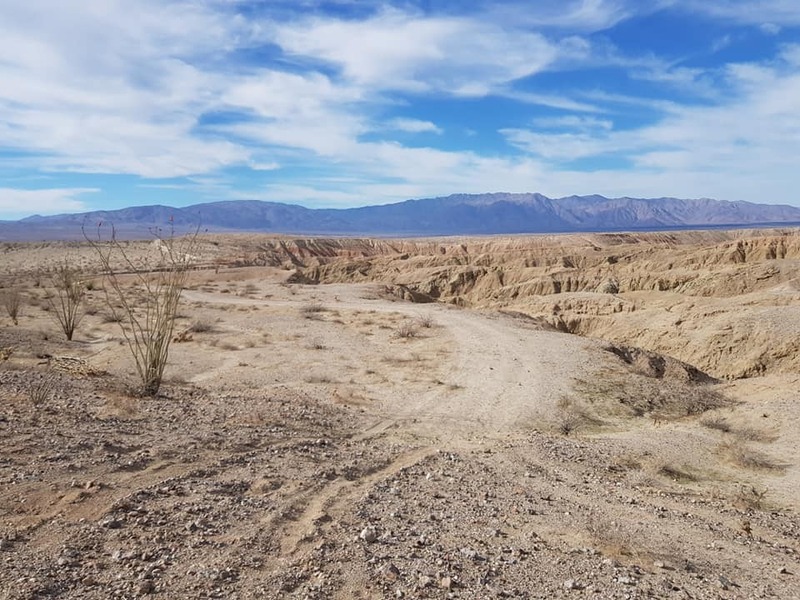 Ma, ad essere onesti, il gioiellino dell'area e del Anza Borrego Desert State Park è indubbiamente il "the slot trail", che vi permetterà di scoprire la vera anima del parco. 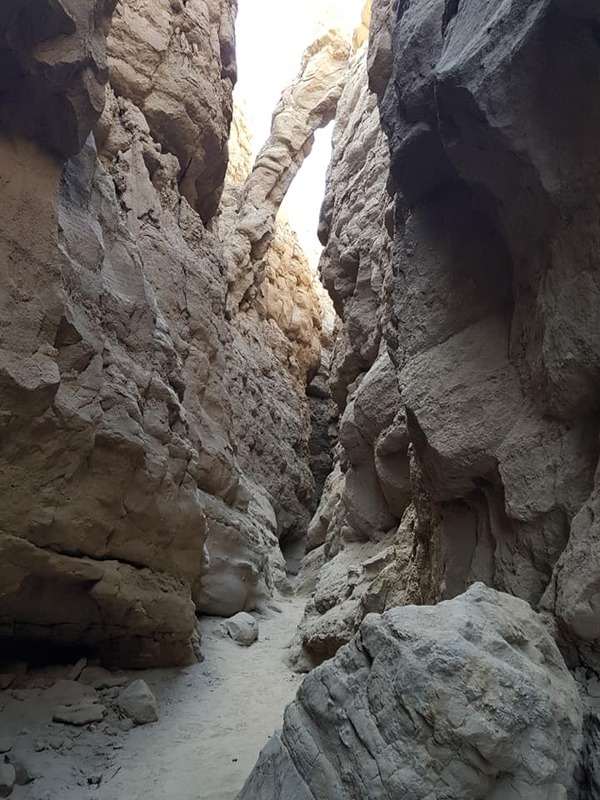 But, to be honest, the jewel of the area and of the Anza Borrego Desert State Park is undoubtedly the "the slot trail", which will allow you to discover the true soul of the park. 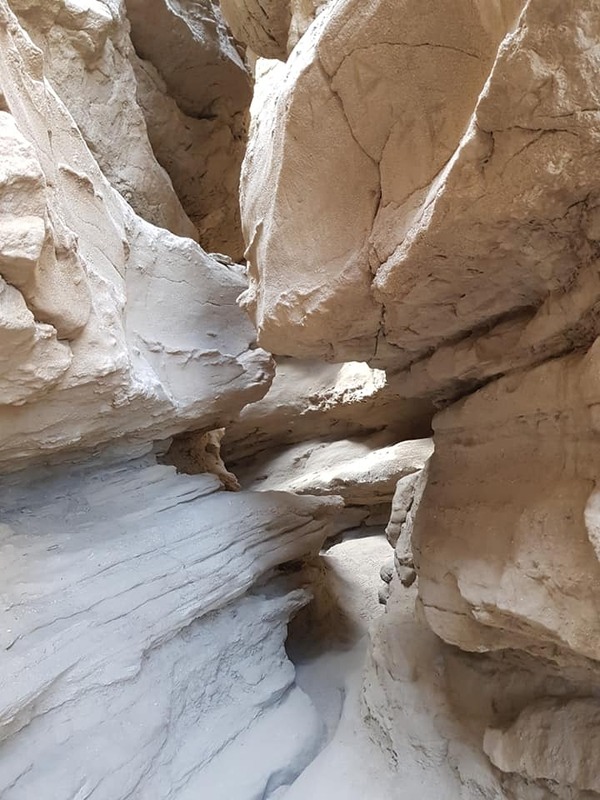 L’agevole escursione attraverso lo stretto canyon di siltite del The Slot è una divertente avventura nel deserto, un’attrazione creata da Madre natura situata a sud est, lungo una strada sterrata percorribile da qualsiasi utilitaria. The easy hike through the narrow canyon of The Slot is a fun adventure in the desert, an attraction created by Mother Nature located to the southeast, along a dirt road passable by any vehicle. Se provenite da est, accertatevi di superare la cittadina di Ocotillo Wells e, dopo circa 4 miglia, svoltate a destra lungo una sterrata, poco prima dell'incrocio con la Borrego Springs Road. Il parcheggio si trova al termine della strada sterrata lunga 1.8 miglia. 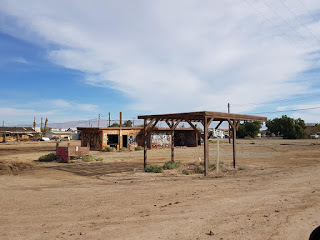 If coming from the east, make sure you pass the town of Ocotillo Wells and, after about 4 miles, turn right along a dirt road, just before the intersection with Borrego Springs Road. The parking lot is at the end of the 1.8 mile long dirt road. You do not need 4wd here (unlike other parts of the park). Anche l’ingresso del canyon non è segnalato con chiarezza, ma vi basterà seguire le orme di chi vi ha preceduto per trovarlo. Se doveste visitarlo in estate, portatevi molta acqua e prestate attenzione ai serpenti ed alle tarantole (noi ne abbiamo vista una - periodo dicembre). Even the entrance to the canyon is not clearly marked, but just follow the footsteps of those who hiked the trail before you in order to find it. 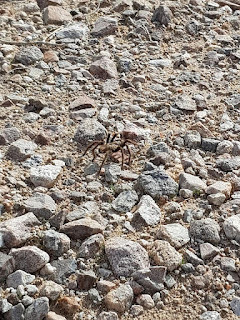 If you were to visit it in the summer, bring a lot of water and be careful of the rattlesnakes and tarantulas (we saw a baby tarantula in december). Il canyon si stringe quasi subito e vi ritroverete in un passaggio davvero stretto e la vostra macchina fotografica vi ringrazierà. 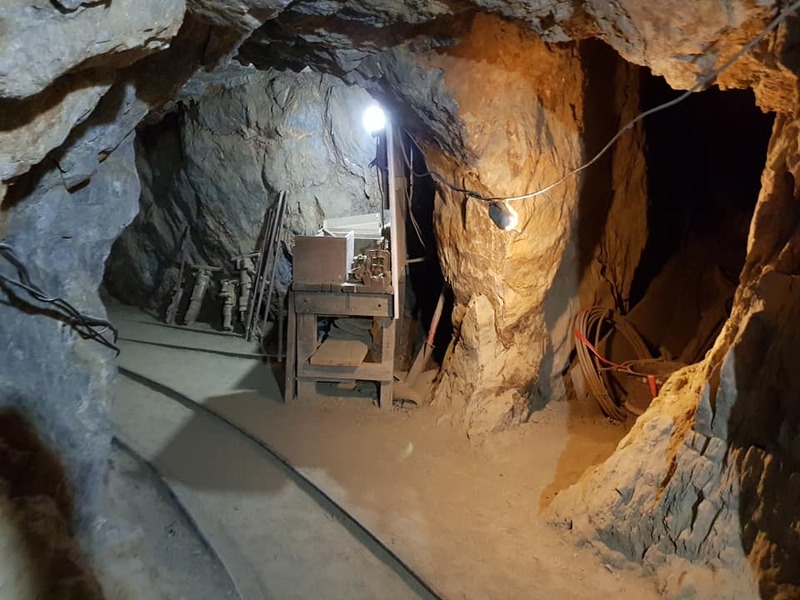 Ad un certo punto il canyon torna ad allargarsi e si unisce ad una via sterrata adatta ai fuoristrada. The canyon tightens almost immediately and you will end up in a really narrow passage: your camera will definitely thank you. 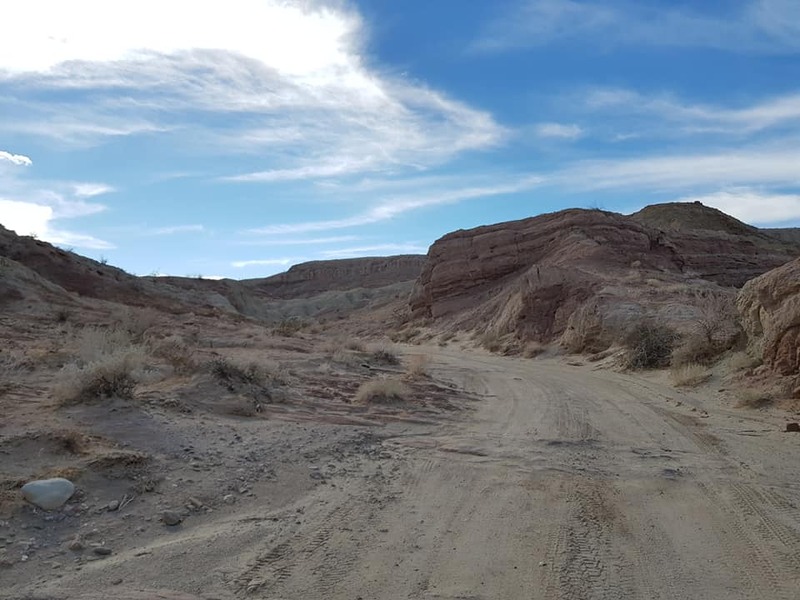 At one point the canyon returns to widen and joins a dirt road suitable for off-road vehicles. Da qui potrete tornare sui vostri passi o completare un loop che non è però semplice da intuire. Noi, infatti, ci siamo persi e siamo dovuti tornare indietro da dove eravamo arrivati. From here you can retrace your steps or complete a loop that is not easy follow. In fact, we got lost and had to walk back exactly the way we came from. Il trail è adatto anche ai bambini ed è molto affollato. Il percorso è lungo 2.3 miglia. Tuttavia la parte più affascinante del percorso di "The Slot" la troverete già dopo sole 0.5 miglia. The trail is also suitable for children and is very trafficked. The hike is 2.3 miles long. However, the most fascinating part of the "The Slot" is located just after 0.5 miles. Poco meno di 30 miglia ad ovest di "The Slot", in un contesto naturale completamente diverso, potrete andare a caccia... dell'oro come i pionieri del vecchio west. Just 30 miles west of "The Slot", in a completely different natural setting, you can hunt for gold like the pioneers of the old west. Qui si fa sul serio, visitando una miniera del 1870, ripristinata nel 1960 dai coniugi Ed ed Ellen Spague. Il tour di un'ora è un autentico viaggio all'interno della miniera, anzi di due miniere, perchè la The Eagle Mining Co è un connubio tra due miniere (la Eagle e la High Peak) che sul finire dell'800 fecero la fortuna dei cercatori d'oro e d'argento che si spingevano fino al sud della California. 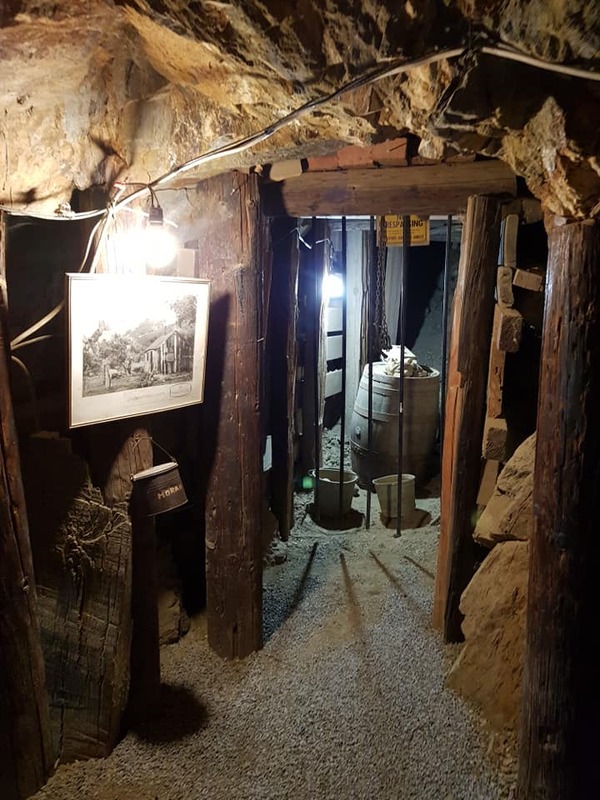 This all just got very real, visitind a 1870 mine, restored in 1960 by the spouses Ed and Ellen Spague. 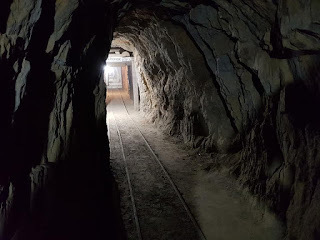 The one-hour tour is an authentic journey iinto the mine, or rather two mines, because The Eagle Mining Co is a combination of two mines (the Eagle and the High Peak) that at the end of the 800s made the fortune of the gold and silver seekers who went to Southern California. Camminerete in cunicoli alti poco più della vostra testa, e sperimenterete la vita dei minatori, ammirando gli oggetti d'antiquariato ed il grande pozzo che portava i minatori sino a 120 metri in profondità. You will walk in tunnels a little higher than your head, and you will experience the life of the miners, admiring the antiques and the big well that brought the miners up to 120 meters deep. Il costo del tour guidato, che viene offerto ogni ora, è di 10 dollari a persona. Gli orari sono i seguenti: dal lunedi al venerdì dalle 10 del mattino alle 4 del pomeriggio, il sabato e la domenica dalle 10 alle 17. The ticket prices of the guided tour, which is offered every hour, is 10 dollars per person. 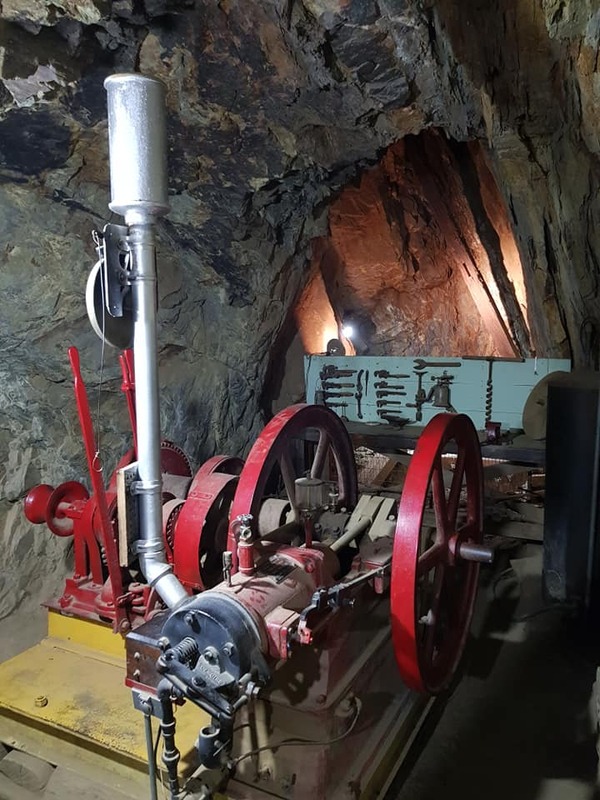 The mine is open from Monday to Friday from 10 am to 4 pm, Saturday and Sunday from 10 am to 5 pm. Anche la città di Julian merita una visita. Incastonata tra le montagne, è un'oasi di pace per chi vuol evadere dal caldo del deserto o dal caos di San Diego, distante poco più di due ore. Poco distante da Julian (2 miglia ad ovest, in direzione San Diego), fermatevi nella piccolissima San Isabel e fate un salto in quella che, abbiamo scoperto, essere un'autentica icona della California e non solo. La Julian Pie Company, che produce le torte di mele (e non solo) più buone della California. Un qualcosa di clamoroso e non solo perchè a Julian e nei dintorni le mele sono deliziose. L'azienda, ormai famosissima in tutto lo stato, produce diverse tipologie di torte che potrete consultare a questo link: https://www.julianpie.com/collections/pies. Even the city of Julian is worth a visit. 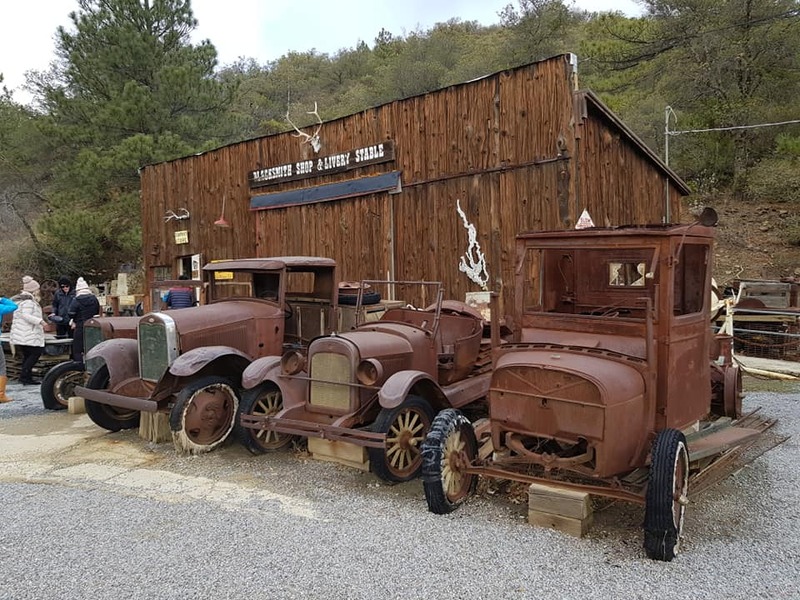 Set in the mountains, it is an oasis of peace for those who want to escape from the heat of the desert or the chaos of San Diego, located just two hours west of Julian. Not far from Julian (2 miles west, towards San Diego), stop in the tiny San Isabel and visit what we now know to be a true icon of California and beyond. 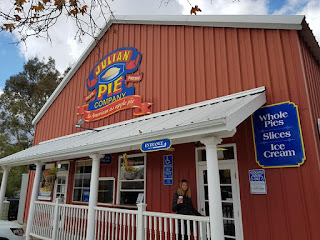 The Julian Pie Company, which produces the best apple pies in California and much more. 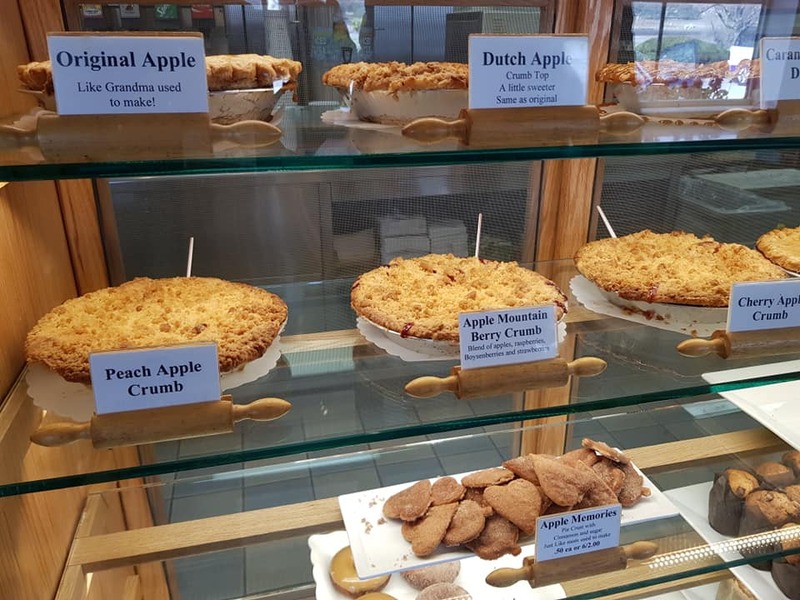 Something resounding and not just because apples are amazing here in Julian and around. 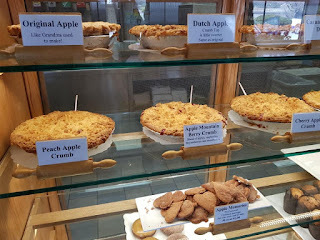 The company, now famous throughout the state, produces different types of cakes that you can consult at this link: https://www.julianpie.com/collections/pies. Potrete assaggiare le meravigliose torte della Julian Pie Company anche nella città di Julian (2225 Main Street), oltre ovviamente al già citato negozio-laboratorio di San Isabel (21976 Highway 79). 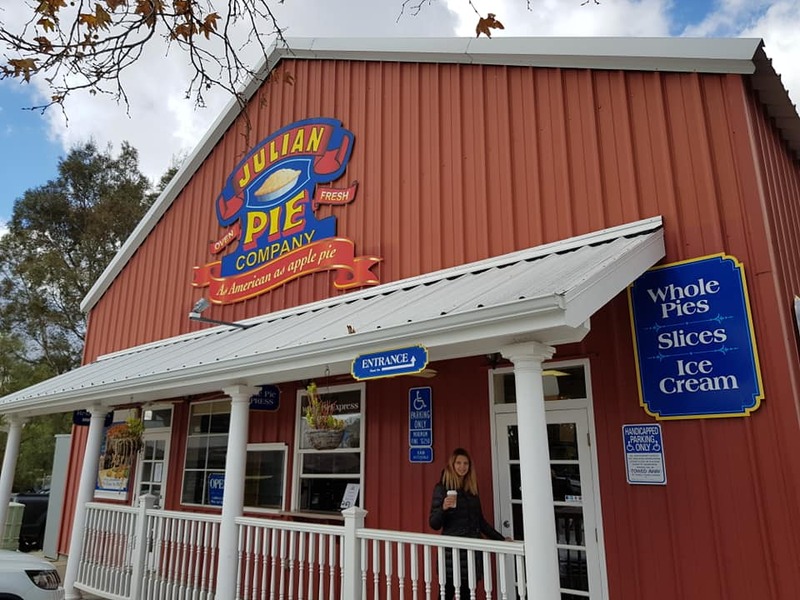 You can taste the delicious cakes of the Julian Pie Company in San Isabel (21976 Highway 79) also in the city of Julian (2225 Main Street). Difficilmente avrete ancora tempo a disposizione nella giornata odierna ma, nel caso aveste saltato uno dei due luoghi di cui abbiamo parlato, potrete fermarvi alle porte di Palm Springs e percorrere uno dei trail degli Indian Canyons. 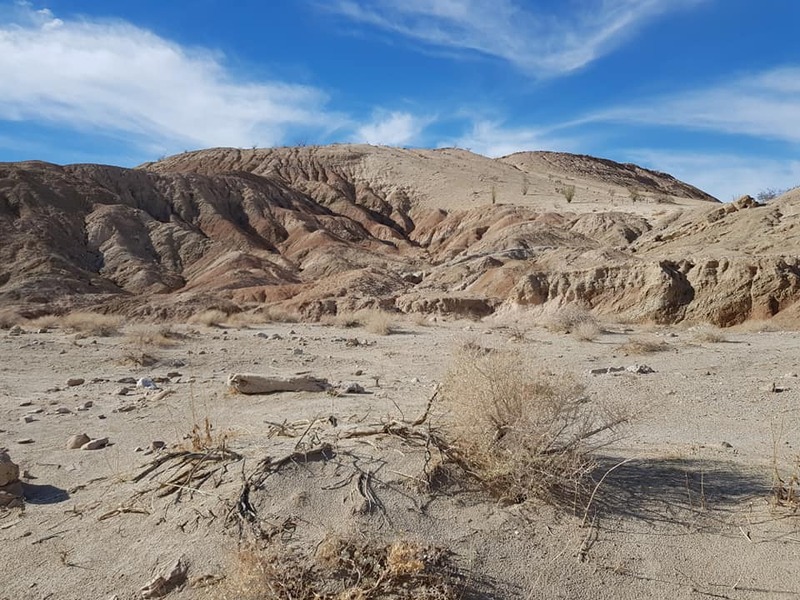 Situati nel territorio della riserva Agua Caliente della tribù pellerossa Cahuilla, a ovest di Palm Springs, questi percorsi vi faranno scoprire l'anima naturale di Palm Springs. Uno dei più famosi è il Tahquitz Canyon (1.7 miglia): qui è possibile partecipare a escursioni guidate o non accompagnate fino alla base di una cascata di 18 metri (non nelle stagioni secche). In alternativa potrete optare per il Palm o l'Andreas Canyon, sentieri sentieri che conducono a colorate formazioni rocciose e oasi di palme e ruscelletti. La lunghezza è dei 3 km ma il primo è sicuramente il più affascinante. Per entrare nella riserva e percorrere i trail dovrete pagare una "day fee". 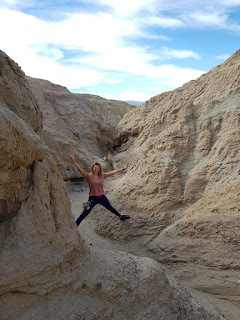 You will hardly still have time available today but, in case you've skipped one of the two places we talked about, you can easily stop at the gates of Palm Springs and take one of the trail of the Indian Canyons. Located in the territory of the Agua Caliente reserve of the Cahuilla Indian tribe, west of Palm Springs, these trails will let you discover the natural soul of Palm Springs. One of the most famous is the Tahquitz Canyon trail (1.7 miles): here you can take a guided tour or just hike alone up to the base of an 18-meter waterfall. 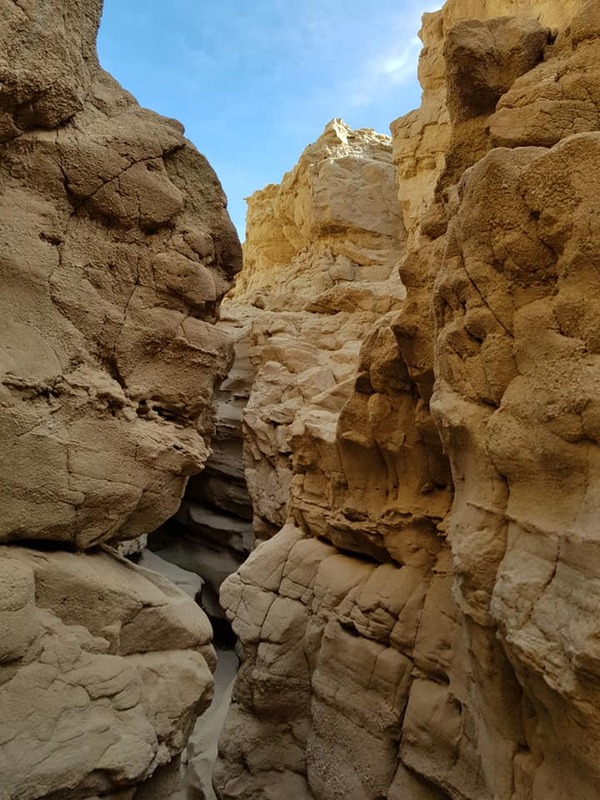 Alternatively you can opt for the Palm or the Andreas Canyon, hiking trails leading to colorful rock formations and oases of palm trees and rivulets. The trail length is 3 km but the first mile is certainly the most fascinating. You will have to pay a "day fee" to enter the reserve and hike those trails. Tra le tantissime cose da fare e da vedere a Palm Springs e nei suoi dintorni, la seconda giornata è sicuramente la più ricca e che vi obbligherà a prendere alcune decisioni importanti. Inserire tutto, come ben sa chi è solito affrontare road trips, non è facile e prendere decisioni in merito a "cosa tagliare dal percorso" e cosa no non è mai facile. 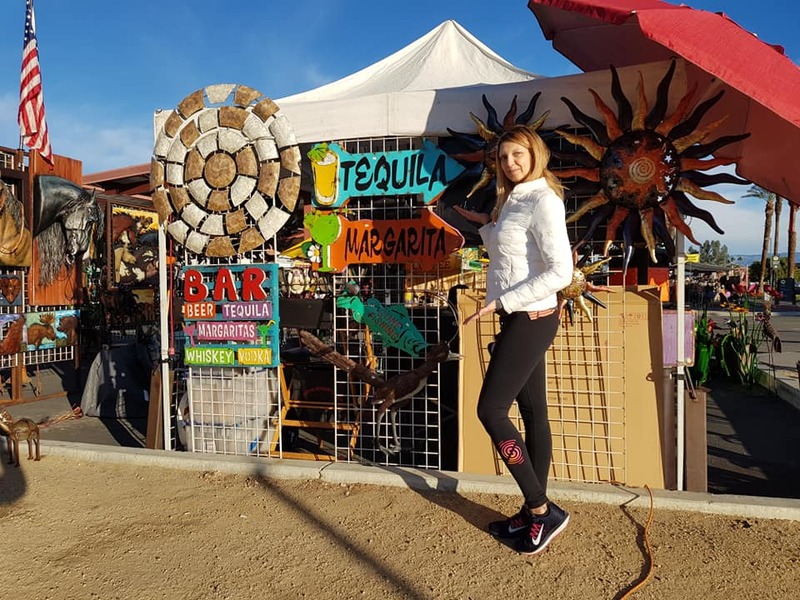 Among the many things to see and do in Palm Springs and its surroundings, the second day is certainly the richer and will force you to make some important decisions. You cannot visit all the beauties of the Palm Springs area and it is not easy to choose what to visit..
La giornata la cominciamo proprio da downtown Palm Springs, da L'Atelier Cafe (129 La Plz, Palm Springs, Greater Palm Springs), per una colazione alla francese che non solo non vi deluderà, ma vi permetterà di affrontare la lunga giornata con la marcia giusta. Il locale è piccolo, semplice, ma vi riporterà in Francia anche grazie ai proprietari francesi (li sentirete parlare tra di loro nella lingua madre) che vi prepareranno piatti dolci e salati, rigorosamente "alla francese". We start the day right with the beautiful downtown of Palm Springs. Don't miss the L'Atelier Cafe (129 La Plz, Palm Springs, Greater Palm Springs), for a French breakfast that not only will not disappoint you, but will allow you to face the long day in the best way. 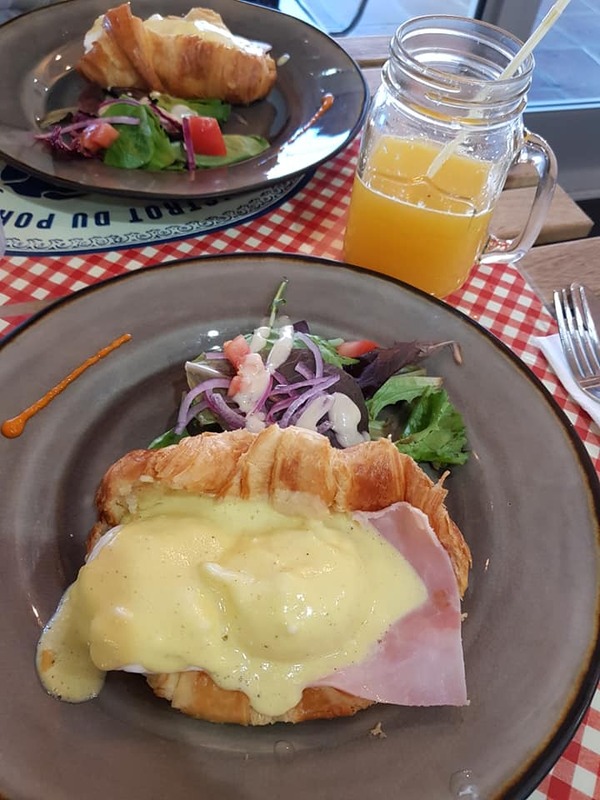 The cafè is small, basic, but will bring you back to France thanks to the French owners (you will hear them talking to each other in their mother tongue) who prepare sweet and savory dishes, strictly French dishes. Approfittando del fatto che la calura del deserto non abbia ancora preso d'assalto l'area di Palm Springs, vi consigliamo di dirigervi subito a nord-est e visitare la più classica delle oasi del deserto, la Coachella Valley Preserve (1000 Palms Canyon Road, Thousand Palms). A parer nostro la principale attrazione naturale dell'area e sicuramente un luogo da non perdere quando si visita Palm Springs ed i suoi dintorni. 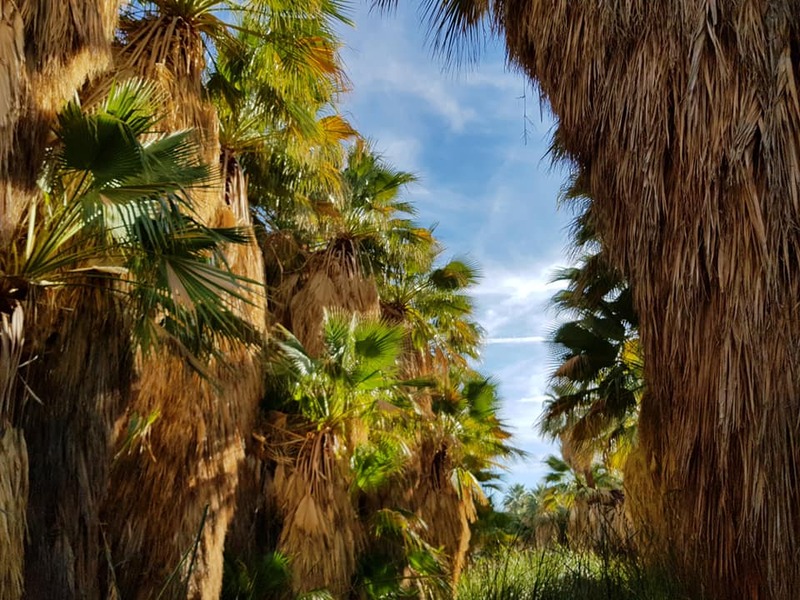 Taking advantage of the fact that the desert heat has not yet stormed the Palm Springs area, we recommend you head straight to the northeast and visit the most classic desert oasis, the Coachella Valley Preserve (1000 Palms Canyon Road, Thousand Palms). 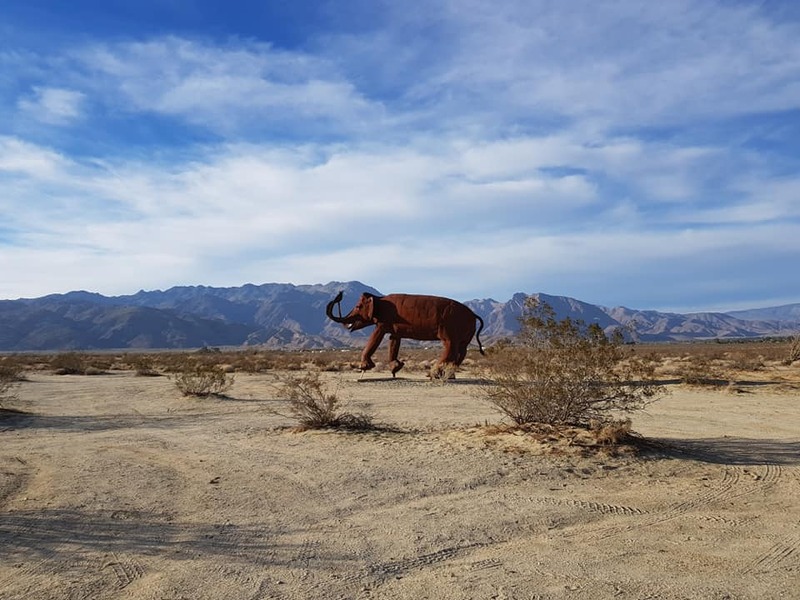 In our opinion, the main natural attraction of the area and certainly a place not to be missed when visiting Palm Springs and its surroundings. La Coachella Valley Preserve si trova a 10 miglia ad est di Palm Springs, immersa tra le scogliere e le colline che circondano Palm Springs. Oltre 17.000 acri che ospitano tra le altre cose anche la lucertola con la frangia tipica dell'area, ma è soprattutto casa delle "thousand palms", un'oasi di palme alimentate dall'acqua che fuoriesce dalla faglia di Sant'Andrea. The Coachella Valley Preserve is located 10 miles east of Palm Springs in the bluffs and mesas of the Indio Hills. It is a 17,000 acre site that is home to the Coachella Valley fringe-toed lizard, which is found nowhere else in the world. 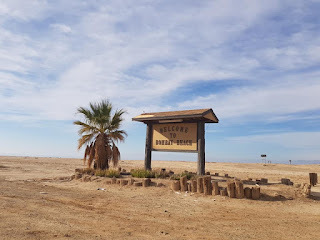 But you'll want to visit it beacause it's home of the spectacular Thousand Palm Oasis which is fed by water seeping out of the San Andreas Fault. Non sono soltanto le Thousands Palms a contraddistinguere la riserva, ma anche le Willis, le Hidden Horseshoe e le Indian Palms, che potrete conoscere meglio attraverso il carinissimo visitor center Paul Wilhelm, costruito per resistere al tremendo caldo del deserto di Sonora. 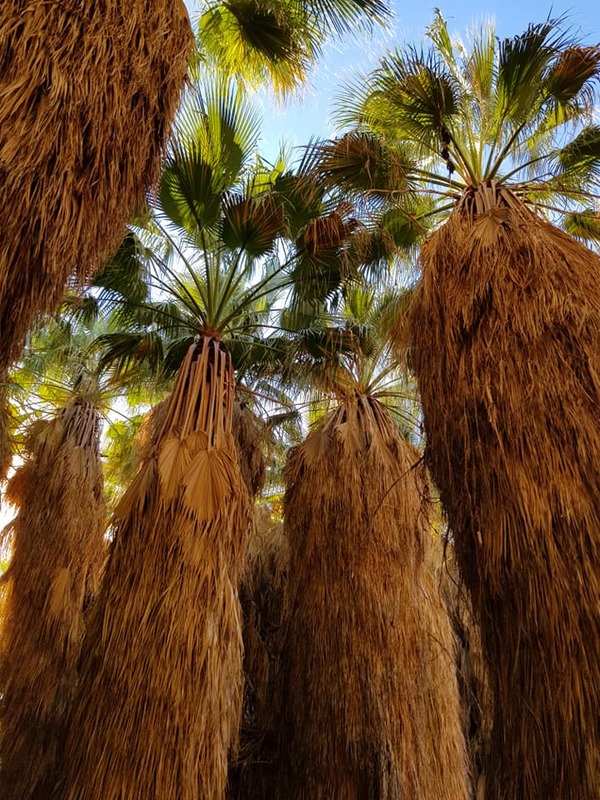 There are also several other Palm Oases, including the Willis, Hidden Horseshoe, and Indian Palms. Don't miss the Paul Wilhelm Grove visitor center, built to withstand the terrible heat of the Sonora desert. Sono diversi i sentieri escursionistici, alcuni dei quali davvero semplici: il più famoso è il McCallum Trail, ma non vanno sottovalutati anche l'Hidden Palms Trail, il Moon Country Trail, il Pushawalla Palms Trail ed il Willis Palms trails. The preserve has several hiking trails including the most famous McCallum Trail. Don't miss also the Hidden Palms trail, the Moon Country trail, the Pushawalla Palms trail, and the Willis Palms trails. Vi consigliamo di non perdervi il semplicissimo McCallum Trail, un trail di 1.5 miglia che per la prima parte si sviluppa su una passerella in legno (per questo molto divertente ed adatto a tutte le età) che scorre nel cuore dell'oasi. Le fermate numerate vi aiuteranno a capire meglio le palme, la faglia di Sant'Andrea e le varie caratteristiche geologiche della riserva. We recommend you to hike the easy McCallum Trail, a 1.5-mile trail that for the first part runs along a wooden walkway (which is very fun and suitable for all ages). It takes you through the heart of the oasis. 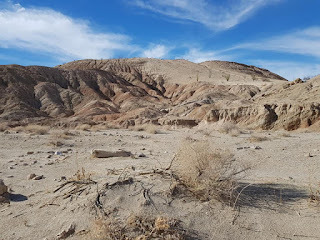 The numbered stops will help you to better understand the palm trees, the San Andreas fault and the various geological features of the reserve. Se vorrete prolungare il trail di ulteriori 3.5 miglia raggiungerete il Moon Canyon Trail. L'attacco del McCallum Trail sentiero è a ridosso del visitor center e solamente la parte centrale del percorso, quella che collega le due oasi, è esposta al sole ed al caldo del deserto. 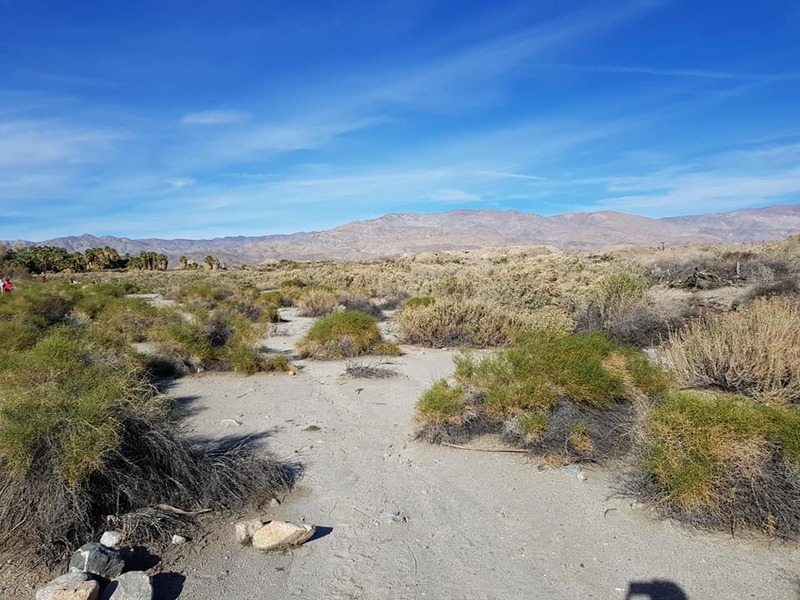 In ogni caso, per chi non volesse raggiungere la seconda oasi ed esporsi al sole, potrà ugualmente gustarsi appieno la Coachella Preserve nella parte iniziale del percorso. If you want to extend the trail for a further 3.5 miles you will reach the Moon Canyon Trail. The McCallum Trail begins of close to the visitor center and only the central part of the path, the one that connects the two oases, is exposed to the sun and the heat of the desert. In any case if you do not want to reach the second oasis and expose yourserf to the sun, just hike the first part of the McCallum Trail and enjoy the beautiful scenery of the Coachella Preserve. 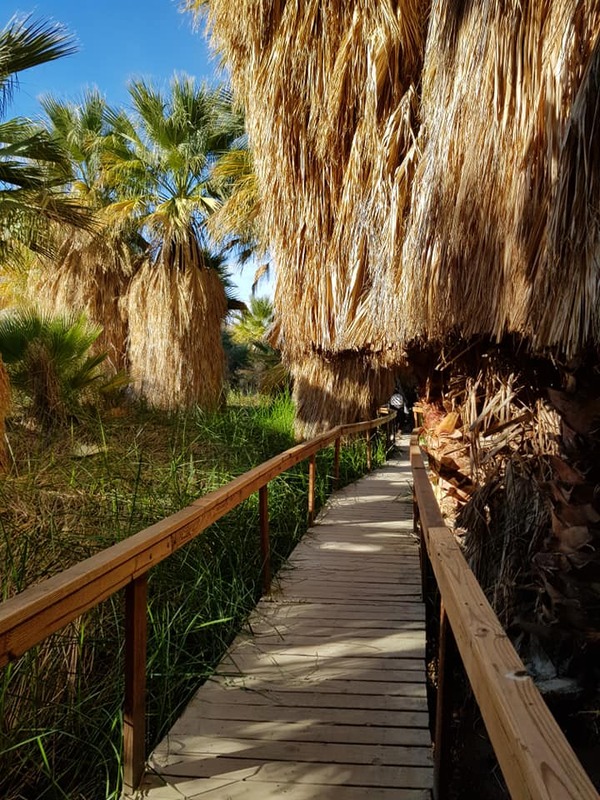 Il trail è un loop che conduce alle Thousands Palms ed al McCallum Pond, un piccolo stagno dal quale potrete scattare splendide fotografie alle palme circostanti. Non vi sembrerà neppure di essere nel cuore di uno dei deserti più caldi e difficili degli Stati Uniti. 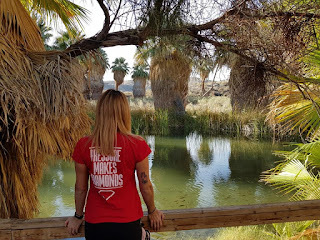 The trail is a loop that leads to the Thousands Palms and the McCallum Pond, a small pond from which you can take beautiful pictures of the surrounding palm trees. You will not even feel like you're in the heart of one of the hottest and toughest deserts in the United States. La vera e propria tappa odierna in auto, di circa 160 km, comincia ora. 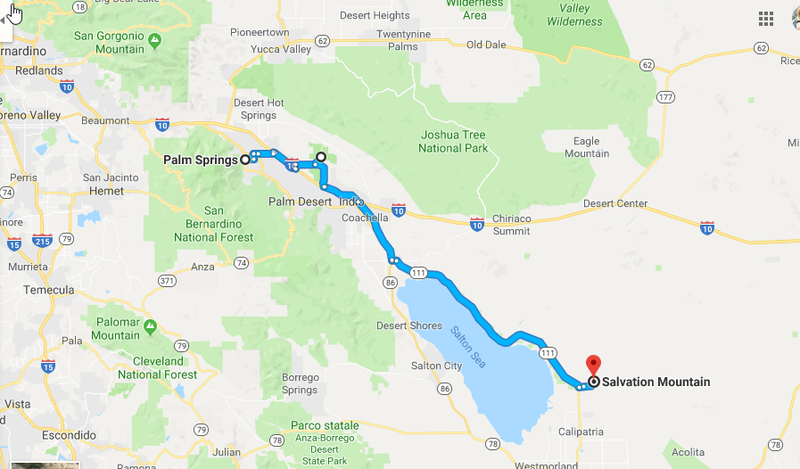 Ci si dirige verso sud, attraversando le cittadine di Cathedral City, Rancho Mirage, Palm Desert, Indio e Coachella, sino a raggiungere Mecca, dalla quale poi deviare verso la sponda est o ovest del Salton Sea. Ma, prima di salutare la civiltà e scoprire uno dei laghi più assurdi al mondo, qualche piacevole stop lungo la strada, tra cui il College of the Desert Street Fair (43500 Monterey Ave, Palm Desert), un grande mercatino che si tiene ogni sabato e domenica dalle 7 del mattino alle 2 del pomeriggio. The real current stage (a 96 miles loop) actually begins right now. 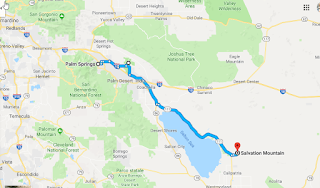 Head south, crossing the towns of Cathedral City, Rancho Mirage, Palm Desert, Indio and Coachella, until you reach Mecca, from which you can then take the detour to the east or west shore of the Salton Sea. 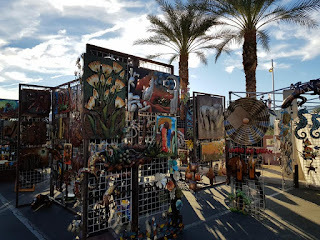 But before saying goodbye to civilization and discover one of the most absurd lakes in the world, some pleasant stops along the way, including the College of the Desert Street Fair (43500 Monterey Ave, Palm Desert), a large flea market held every Saturday and Sunday from 7 am to 2 am. 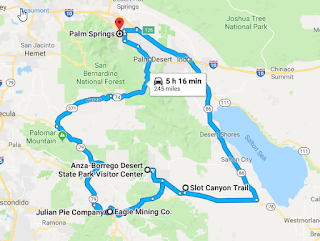 Troverete di tutto, dall'oggettistica locale al cibo in quello che a tutti gli effetti è il market più amato dagli abitanti di Palm Springs e dintorni. 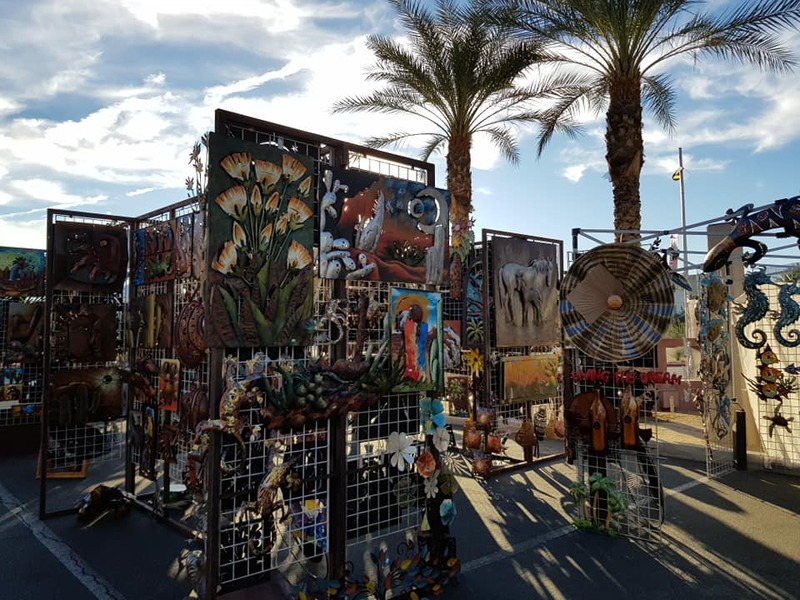 You will find everything from local objects to food in a place that is definitely the most popular market in Palm Springs and its surroundings. Da non perdere anche lo Shield's Date Farm (80225 US Highway 111, Indio) e l'International Banana Museum. Il primo è il paradiso dei datteri che da queste parti sono un autentica religione. La famiglia Shields arrivò nel deserto nel 1924 e fece costruire un autentico paradiso del dattero, uno splendido giardino con annesso un carinissimo shop dedicato in buonissima parte ovviamente al... dattero. L'altra chicca è l'International Banana Museum, che purtroppo noi abbiamo trovato chiuso. Il museo ospita oltre 20mila oggetti tutti a tema banana, tanto da essere conosciuto anche come il "bananabilia". Il proprietario Fred Garbutt, stando a quanto abbiamo scovato su internet, è un personaggio d'altri tempi. L'ingresso al museo costa 1 dollaro, gratis nel caso acquistiate qualcosa. Il museo dovrebbe essere aperto dal lunedì al venerdì, ma è consigliato chiamare prima di visitarlo. 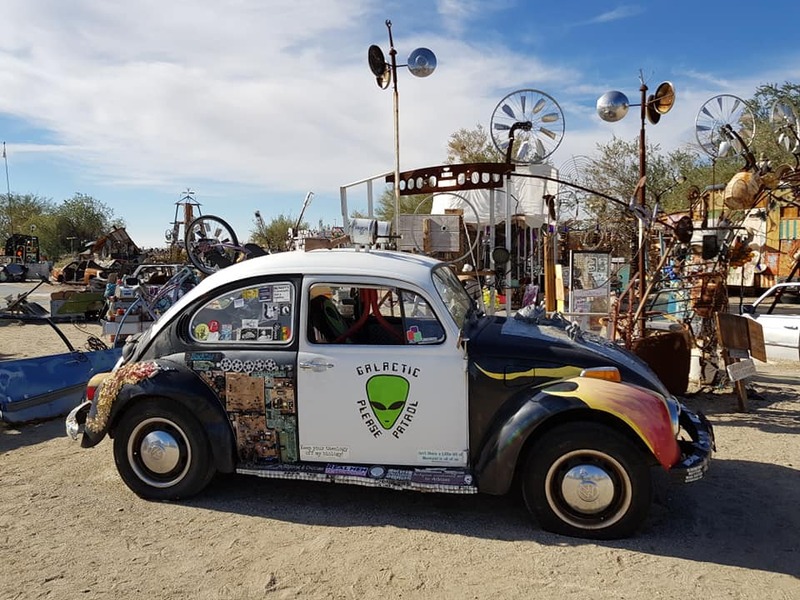 Do not miss the Shield's Date Farm (80225 US Highway 111, Indio) and the International Banana Museum. The first is the paradise of dates that in the area are an authentic religion. 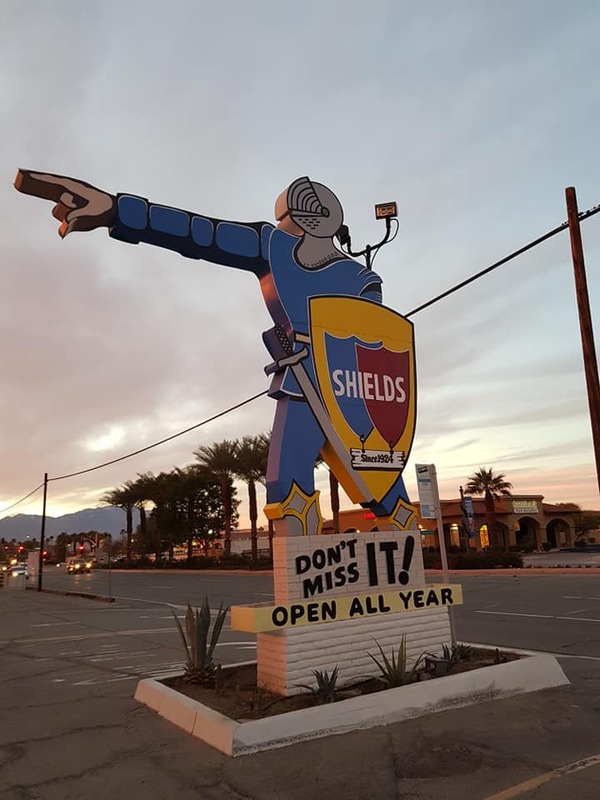 The Shields family arrived in the desert in 1924 and founded the company. Floyd Shields was one of the pioneering date farmers in the still-young date industry of the Coachella Valley. To help promote the exotic, difficult-to-grow fruit, Shields presented lectures to his customers on the cultivation of the date. The lectures proved to be a popular draw, leading Shields to incorporate a slide show and recorded soundtrack into a multimedia presentation designed to run on a continuous basis. There is also a beautiful garden with a nice shop. The other gem is the International Banana Museum, which unfortunately was closed when we visited it. The museum houses over 20 thousand objects all with a banana theme, so much so that it is also known as the "bananabilia". The owner Fred Garbutt, according to what we found on the internet, is a character. Admission to the museum is 1 dollar, but it's free if you buy something. The museum should be open from Monday to Friday, but we recommend to make a phone call before visiting. Delle città che costeggiano il lago non resta altro che il loro intrigante nome ed edifici in stato di degrado ed abbandono. Salton City, Salton Sea Beach e Desert Shores, nella parte ovest del lago, e Desert Beach, North Shore e Bombay Beach, in quella est sono il sogno mai concretizzatosi di un'area che al giorno d'oggi non è completamente abbandonata soltanto "grazie" all'immigrazione dal vicino Messico. Sono diversi, infatti, i clandestini sudamericani che hanno preso possesso delle abitazioni lasciate vuote dai precedenti abitanti. There is nothing left about the cities that border the lake. Just their intriguing name. 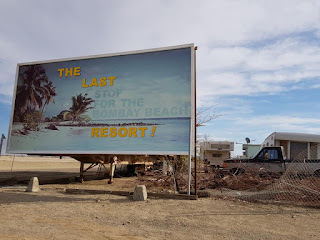 Salton City, Salton Sea Beach and Desert Shores, in the western part of the lake, and Desert Beach, North Shore and Bombay Beach, in the east are the dream never realized of an area that today is not completely abandoned only " thanks "to immigration from neighboring Mexico. In fact, there are several South American illegal immigrants who took possession of the houses left empty by the previous inhabitants. Essendo un lago chiuso, le sue acque presentano livelli allarmanti di inquinamento, dovuti in gran parte alle acque fluviali che provengono dal Messico, dove sono ancora in uso prodotti chimici per agricoltura decisamente inquinanti. La situazione delle sue acque è così grave che è divenuto pericoloso sia mangiarne il pescato sia il semplice farvi il bagno. Being a closed lake, its waters possess alarming levels of pollution, due in large part to the fluvial waters that come from Mexico, where polluting chemical products for agriculture are still in use. The situation in its waters is so serious that it has become dangerous to eat the fish or just take bathe in the lake. Un declino inarrestabile, non da ultimo a causa dell’agricoltura intensiva praticata intorno al lago. Perché questa parte di deserto è stata trasformata in pianura coltivabili e produce il 60% del raccolto ortofrutticolo invernale degli interi Stati Uniti. 2.000 kmq di campi in cui da decenni si fa uso massiccio di fertilizzanti e pesticidi. An unstoppable decline, because of the intensive agriculture practiced around the lake. Yes, this part of the desert has been transformed into cultivable plains and produces 60% of the winter fruit and vegetables of the entire United States. 2,000 sq km of fields and farms in which massive fertilizers and pesticides have been used for decades. Le grandi attrazioni dell'area sono Salvation Mountain e Slab City. Centinaia di turisti ogni giorno le visitano, rendendole le uniche attrazioni degne di nota di un'area abbandonata a se stessa. Salvation Mountain è una coloratissima montagna voluta dall'ex veterano Leonard Knight e costruita a tema religioso con ogni tipo di materiale. The main attractions of the area are Salvation Mountain and Slab City. Hundreds of tourists visit them each day, making them the only notable attractions of an area left to itself. 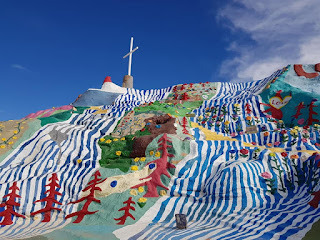 Salvation Mountain is a colorful mountain desired by former veteran Leonard Knight and built on a religious theme with all kinds of material. Leonard, la cui vita fu interamente dedicata a Dio, ha vissuto accanto alla "sua" scultura accogliendo ogni giorno i tantissimi turisti che accorrevano per visitarla. L'ingresso a Salvation Mountain è da sempre gratuito, ma sono accettate donazioni. Leonard, whose life was entirely dedicated to God, lived next to his sculpture welcoming every day the many tourists who wanted to visit it. 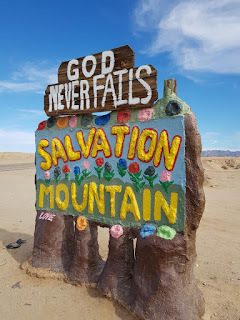 Admission to Salvation Mountain has always been free, but donations are accepted. Durante i primi giorni di permanenza nei pressi della città di Nilan. Leonard Knight pensò di utilizzare dei piccoli palloni aereostatici per trasmettere il suo messaggio di amore universale. During the first days spent close to the city of Nilan, Leonard Knight thought of using small balloons to convey his message of universal love. Non contento di questo iniziò a creare qualcosa con cemento, della vernice e tutto quello che potesse essere utile. 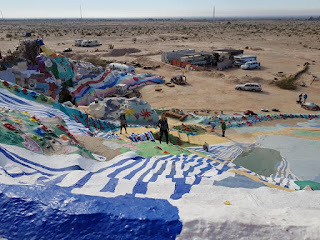 Dopo 28 anni di lavoro concluse la sua opera, la Salvation Mountain che, dall'alto dei suoi 50 metri, sovrasta l'intera l'area sino al Salton Sea. He wasn't totally happy . So he began to create something with cement, paint and all that could be useful. After 28 years of work he completed his work, the Salvation Mountain: it is 50 meters high, and dominates the entire area up to the Salton Sea. Salvation Mountain è apparsa sulle copertine degli album ...and the Circus Leaves Town e Muchas Gracias: The Best of Kyuss degli Kyuss. Inoltre appare nel film Into the Wild - Nelle terre selvagge, e nel gioco Grand Theft Auto V della Rockstar Games. Salvation Mountain has appeared on the covers of the albums ... and the Circus Leaves Town and Muchas Gracias: The Best of Kyuss degli Kyuss. It also appears in the movie Into the Wild and in the game Grand Theft Auto V of Rockstar Games. 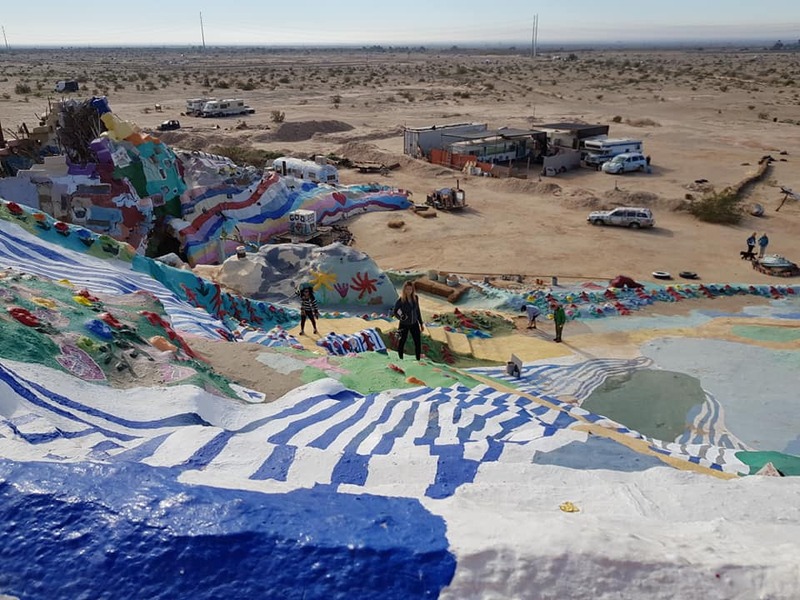 Se Salvation Mountain avrà certamente catturato la vostra attenzione, anche l'adiacente Slab City farà altrettanto. "The Slabs" è un accampamento situato a ridosso della "montagna della salvezza" e composto da camper roulotte: qui ci vivono nomadi, hippie, artisti, o semplicemente persone che vogliono sfuggire dalla civiltà. Perchè una delle tante grandi anomalie dell'area che circonda il Salton Sea e dell'abbandono in cui riversa, è la nascita di piccole comunità autogestite. 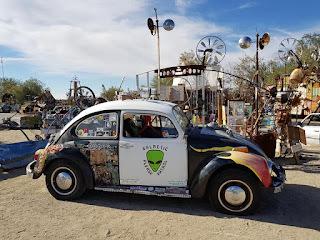 Quella di Slab City nacque negli anni '50 all'interno dei 640 acri di terra abbandonata ad una decina di km dal lago. La comunità vive senza elettricità, acqua corrente o alti servizi in genere ed è decisamente più "viva" nei mesi invernali, quando le temperature sono più abbordabili. 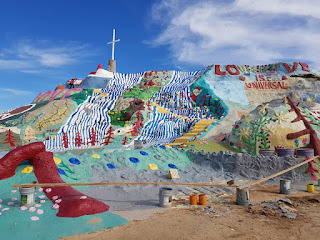 If Salvation Mountain has certainly got your attention, the adjacent Slab City will definitely do the same. 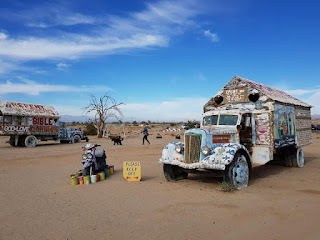 "The Slabs" is an encampment located near the Salvation Mountain and composed of camper trailers: nomads, hippies, artists, or just people who want to escape from civilization live in this place. Because one of the many anomalies of the area abandoned surrounding the Salton Sea, are the small self-managed communities. That of Slab City was born in the '50s within the 640 acres of land abandoned about ten kilometers from the lake. 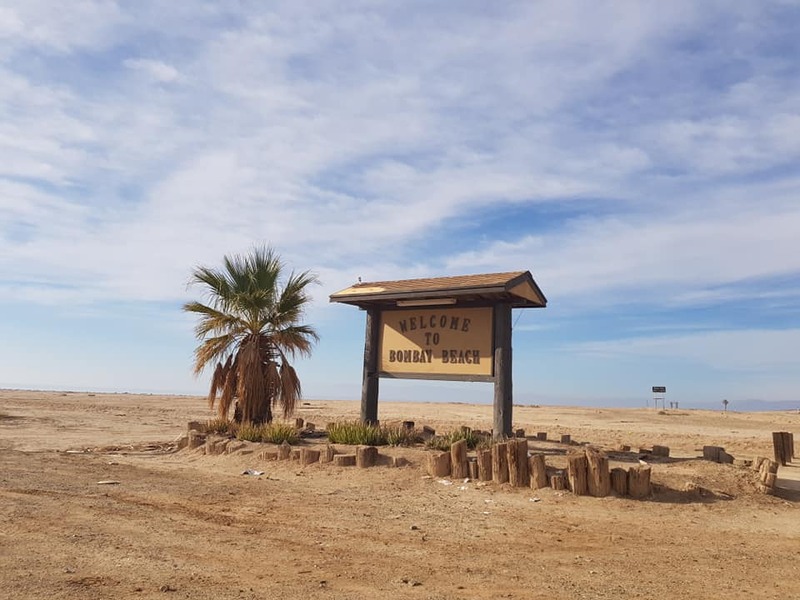 The community lives without electricity, running water or high services in general and is definitely more "alive" in the winter months, when the desert temperatures are not so high. Chi vive qui, lontano dalla civiltà ma anche dalle regole, può fare affidamento su pannelli solari e un sistema di scarico personale. Si condivide una doccia comune ed una cisterna di cemento viene alimentata da una sorgente calda a qualche metro di distanza. 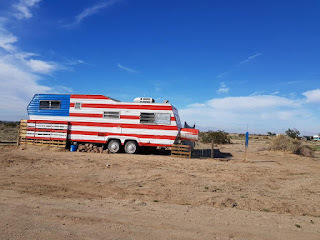 Non essendo una realtà tutelata dal governo americano molte persone vengono spinte a provare l’esperienza di vita di Slab City. Those who live here, far from civilization but also from the rules, can rely on solar panels and a personal unloading system. You share a common shower and a cement tank is fed by a hot spring a few feet away. 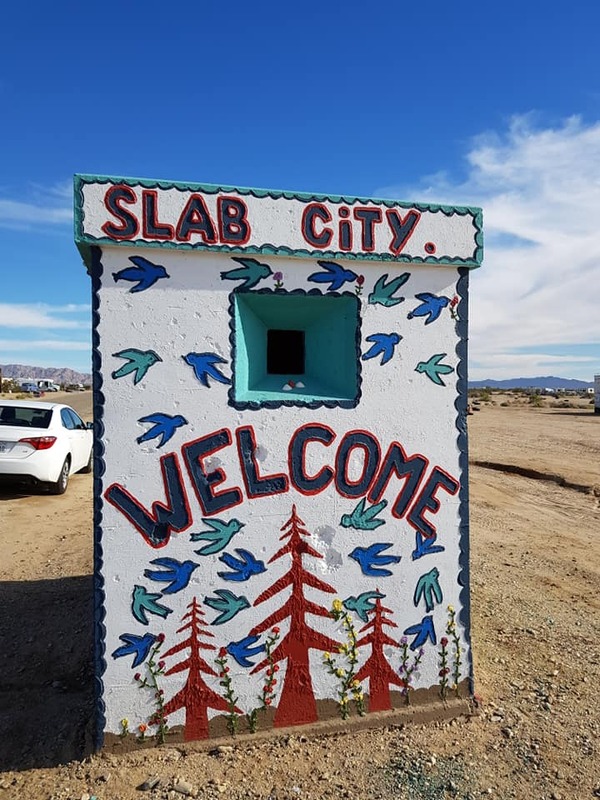 This village is not protected by the US government and many people are pushed to try the life experience of Slab City. Non immaginatela tuttavia come una zona anarchica o di guerriglia. La comunità è ormai ben radicata e nel corso degli anni sono comparsi la biblioteca, un piccolo e improvvisato campo da golf, un giardino di sculture, diversi circoli e luoghi dove si suona musica dal vivo e si balla. But do not imagine it as an anarchist or guerrilla zone. The community is now well established: the library, a small golg field, a garden of sculptures, different circles and places where you play live music and dance have been introduced over the years. 10 THINGS TO SEE IN "PHILLY"
USA - EAST OR WEST? "THE BEST OF..." TOP 20! Tema Viaggi. Immagini dei temi di 1_trick_pony. Powered by Blogger.